Once upon a time, there was a Scotsman called Mungo Park. Bored of life in late 18th century Blighty, he set out to lose himself in Africa. And he did, or so the story goes. And so Kinder Aggugini set out to lose himself in the story, laying before us his vision, sophisticated and raw, imaginary and real, of mother Africa, to whom our Northern, Western, masked - or kilted - selves die to return to. On a stage with heaps of animal skins, tusks, rocking to tribal music, enter the softest kilts and suits, the white shirts and woolly jackets that brought our naïve travellers to this land. Only here, colours are meant to blend into the landscape, or bounce back light. Then, sooner rather than later, the adventurer changes into more appropriate clothes, as we are all hurled into the middle of the smartest looking safari. 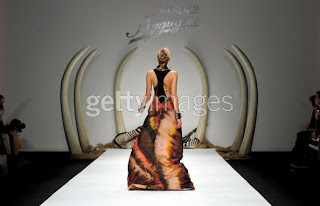 Next, animal and tribal prints slowly take over... intricate draping, details and jewellery, sash belts. Short, then full lengths, as the transformation, dropping "the mask that should not be there", or the inner journey into the wild, takes place before our eyes. Kinder Aggugini invites us to peel back those layers and go deeper ourselves, but can we feel the change in our hearts? I must confess I did not fully turn. Am I not ready yet, or is this who I am? In my heart, I'm forever stuck between the traveller and the safari. But at least I'm perfectly in tune with my sartorial centre.